Carbonara is awesome! It is a roman pasta sauce made from just 4 ingredients – any old cured pork (Bacon/Pancetta/Speck/Guancale), egg yolks, Parmigiana-Reggiano cheese, and a little white wine. The result is a creamy rich sauce with possibly the most perfect blend of those two most complimentary of flavours; Bacon and Egg. Over a freshly made Pasta, this is absolutely delicious … but Pasta is a big problem for Lo-Carb living. Pasta is mostly starch, and you can only eat a very small amount before the carbohydrates will knock you straight out of Ketosis. 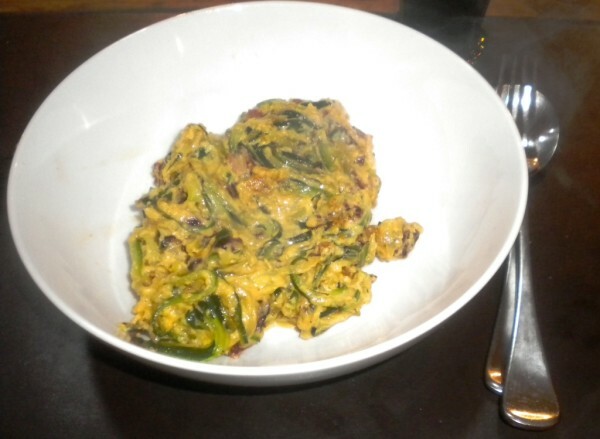 The trick is that we’re going use Zucchinis (or Courgettes) which still have some carbs, and we’ll slice them into very thin strips – skin and all, then steam them for a few minutes in the microwave and fry them in a little oil and they will have almost the same texture as fresh pasta, and hold sauces almost as well. 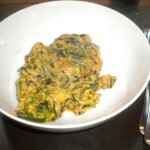 Zucchini made into pasta is often called Zoodles or Zucchini Noodles. Until I was taught this technique I hated Zucchinis. Really. Everything else I had had them in was pretty horrid. But this one technique has singlehandedly redeemed the vegetable for me. We’re even growing them in our garden. We’ve tried a bunch of techniques over the past year to make Zoodles. There is a gadget advertised on TV, I’m sure you’ve seen it, called the Spiralizer – it’s like a giant Pencil sharpener but it is really rubbish for zucchini. The center of a zucchini is full of seeds that don’t have the structural integrity required to slice neatly, so the center hole of a Spiralizer becomes clogged with seed pulp after just a few rotations. It’s probably only good for Carrots and other hard vegetables. 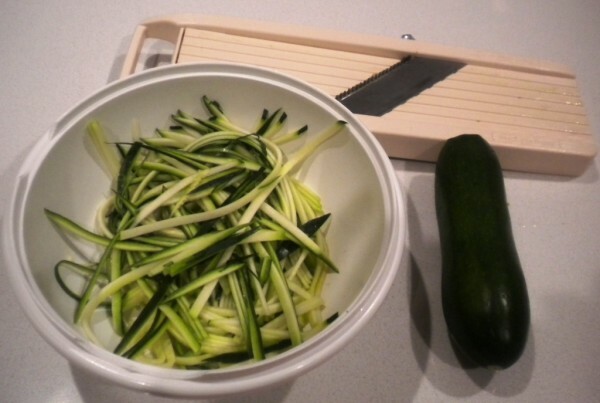 You can use a sharp knife to cut the Zucchini into strips on a chopping board but that takes a bit of time, and unless you have preternatural knife skills, the resulting noodles will not be evenly sized, and they won’t cook uniformly. The best way we have found is to use a very sharp mandoline with a medium Julienning blade fitted. 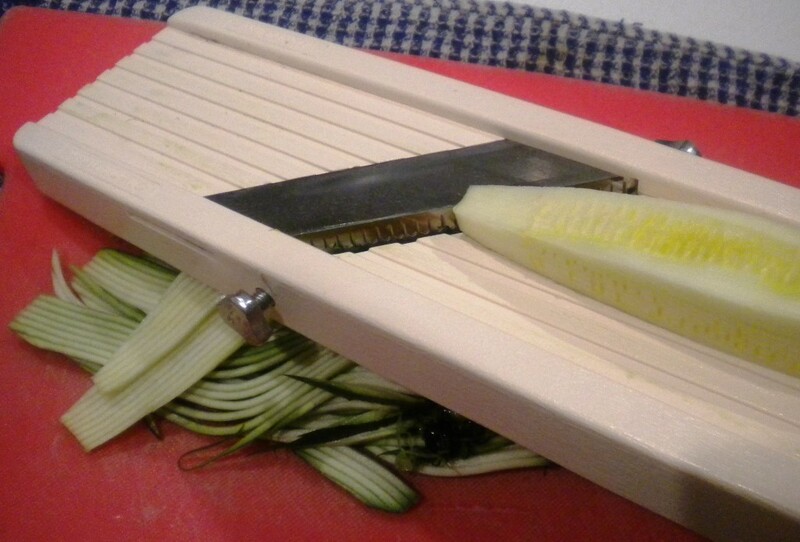 My favourite kitchen gadget at the moment is a Benriner Japanese mandoline which has viciously sharp blades. 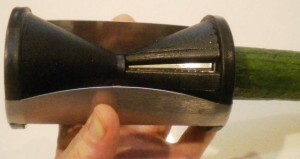 You need to treat a mandoline like this with respect because it isn’t just a plastic kitchen time saving device, it is a precision knife mounted horizontally and it will flay your fingers open if you aren’t paying attention. I don’t use the finger guard on zucchini because I’m not going to be using all the vegetable. For Zucchini I find the best technique is to take two passes then turn the vegetable 90 degrees, repeat for all 4 edges and then toss the remaining pith full of seeds in the compost. It takes about 10 seconds to turn a Zucchini into a bowl of Zoodles. One solution is to use Bacon ends. 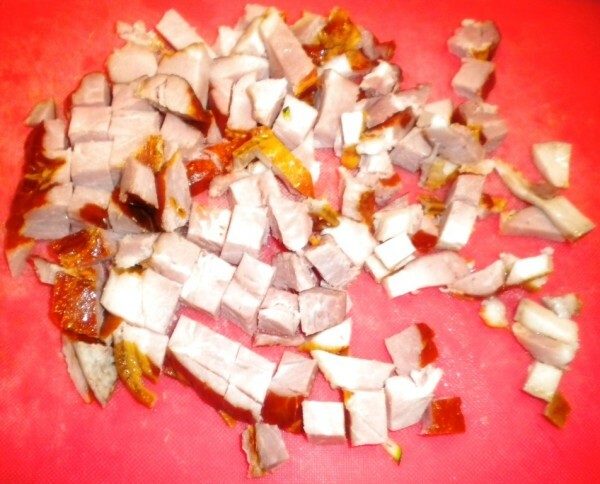 When a butcher makes Bacon he slices a large smoke cured pork belly into strips called rashers. 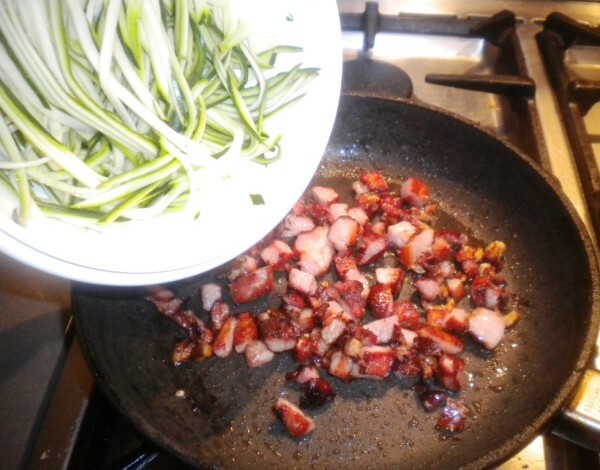 The bits at the end that are too small to slice into rashers are usually quite fatty and considered wastage, but I managed to find some at our local CostCo for $2 for 200g chunks that were perfect for 2 servings. Any butcher that smokes his own pork will probably be able to source you some, but another good option is smoked Speck which you can probably find in the deli section of your supermarket. 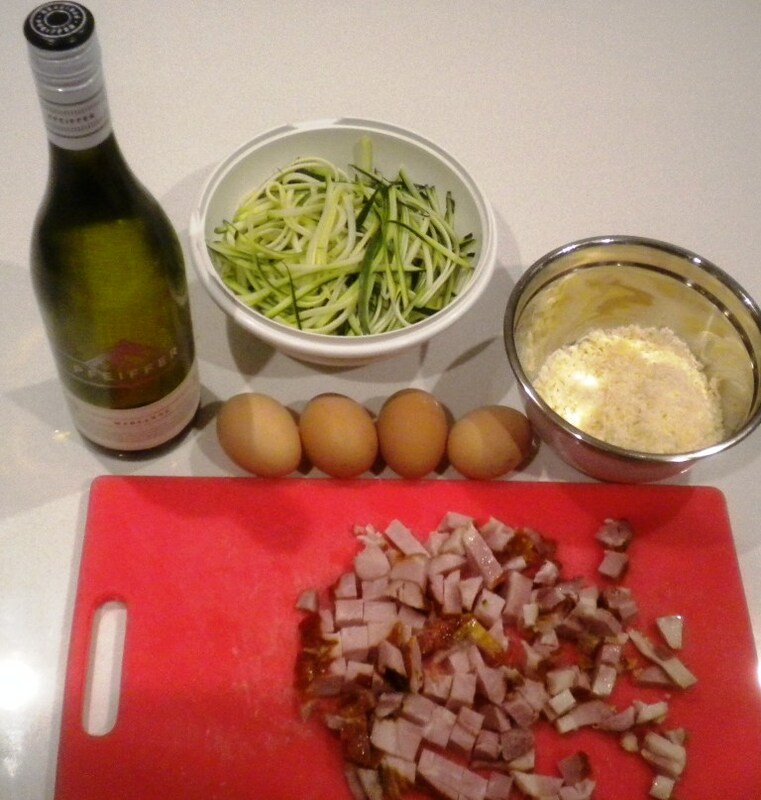 So this plate of Zucchini Carbonara cost $1 for the meat, $1 for the zucchini, 50c for the 2 eggs, $1 for the cheese, and maybe 50c worth of wine – let’s say $4 per plate. OK so maybe it’s not quite as cheap as Maccas, but the flavour is most definitely superior. 1 tbsp olive oil optional: If your pork doesn't have a lot of fat to render out. Use a mandoline to cut the Zucchini into "spaghetti" strips. 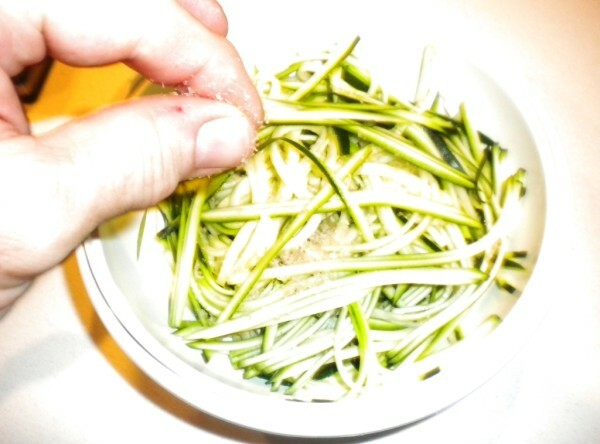 You can stop once you reach the seeds in the center of the zucchini - they aren't really structurally useable to make pasta. 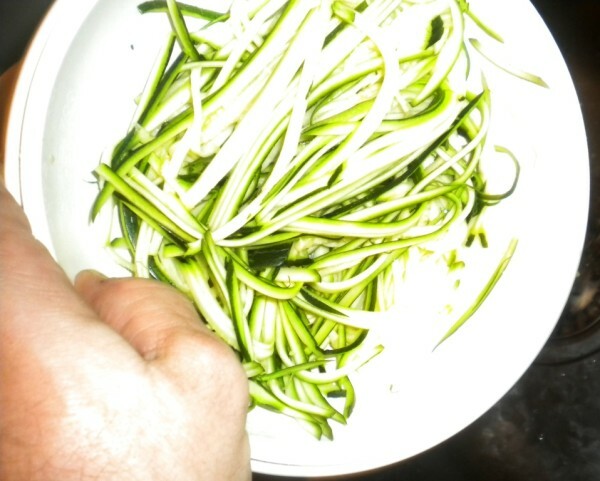 Salt the Zucchini "pasta" to help draw a little of the water out of the vegetable. 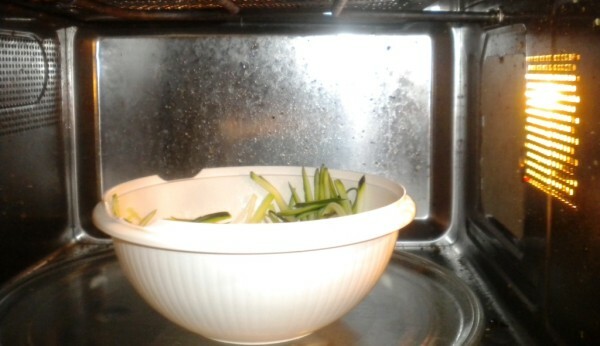 Microwave on high for 2 minutes to soften the pasta and start it cooking. Drain off any water that has come out of the "pasta" and reserve it. We'll use it later to add to the sauce to stop it seizing. Chop pork into 1cm chunks, and fry in a frypan until crispy and the fats have rendered out. 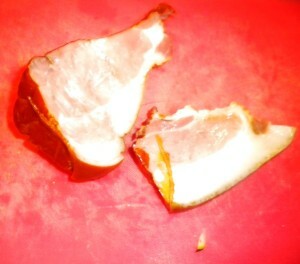 If your pork doesn't have a lot of fat (eg: if you are just using lean bacon) then just add a tablespoon of Olive oil. Add zoodles to the frypan with the pork and toss in the oil until it's just started to go golden - then take the pan off the heat and allow the momentum of the pan to finish cooking the zoodles. Make a double boiler using a glass bowl sitting on top of a pan containing a little water brought to a boil. We're going use this to cook the yolks slowly without letting them curdle. 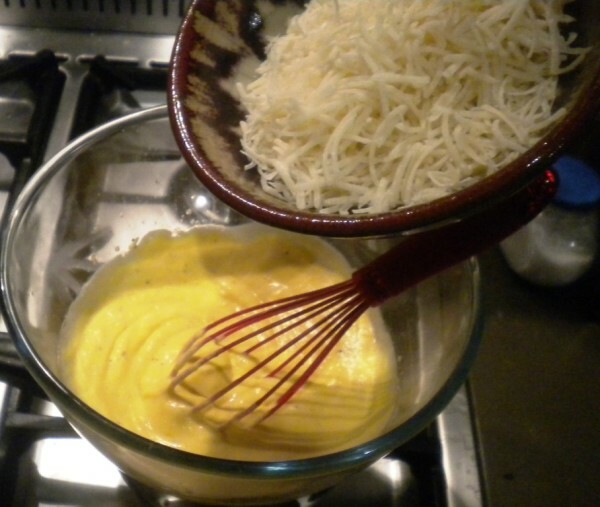 Add Egg Yolks, Wine, Cheese and a little Pepper to the double boiler and whisk while gently heating until combined into a smooth sauce. 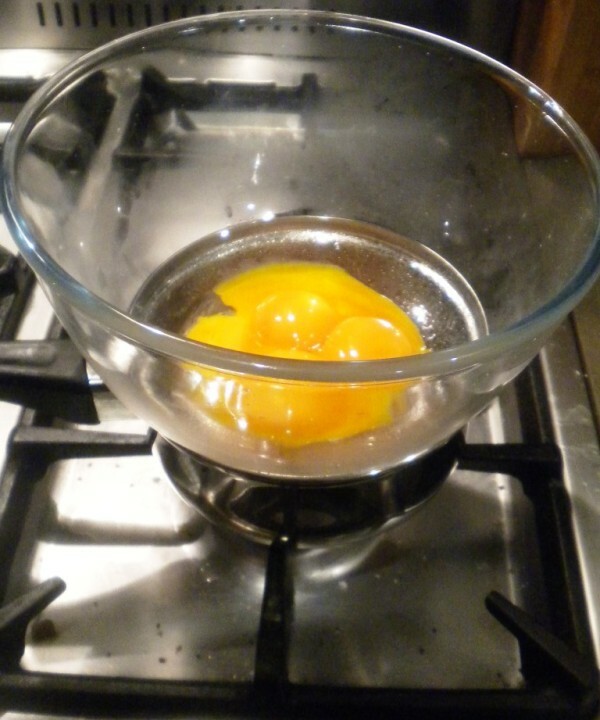 If the eggs do start to form lumps in preparation to curdling you can take the bowl off the pan and put it on a tea towel letting the temperature drop while whisking. 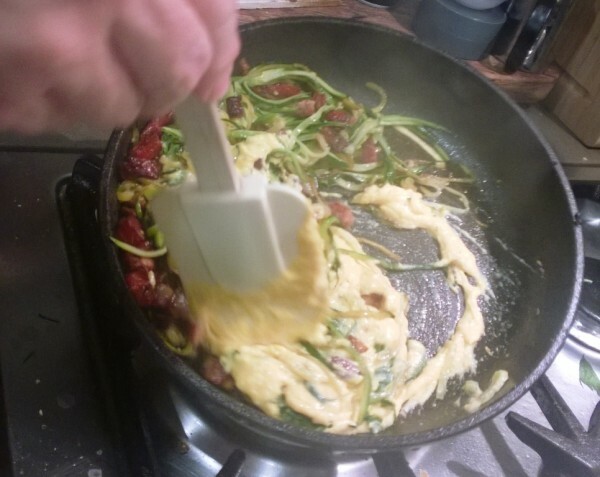 Once the sauce is silky smooth add it to the cooling Pork/Zucchini pan and gently fold through - the eggs will finish cooking from the residual heat in the Zucchini. If the sauce starts to seize (get very thick) you can let it down by adding a little of the Zucchini water you reserved earlier. My plate here you'll see seized up a bit because I put the hot cheesy sauce on a cold plate, and didn't really have enough Zucchini water to add to it at the end. I probably should have added an additional teaspoon of hot water.